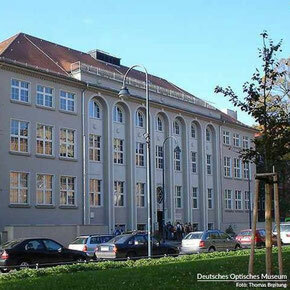 The focus of the Deutsches Optisches Museum is on the natural sciences and technology. The exhibits teach visitors about the development of optical instruments over the course of five centuries. The museum also shows how Jena became the "City of Optics" in connection with Carl Zeiss, Ernst Abbe and Otto Schott. The museum's exhibits are divided into twelve different areas and are spread out over three floors. Approximately 2,000 objects are on display. The Deutsches Optisches Museum continues to expand its collection. In addition to purchased objects, private gifts also play an important role. The Museum Curator, Mr. Jürgen Hellwig, is responsible for overseeing the scholarly study and care of this wide-ranging collection. Should you have any questions about the objects on display, please contact him.